As a Bankruptcy attorney in Sacramento California, questions about obtaining a small business loan after bankruptcy are reasonably common. Specifically, small business owners who have declared personal bankruptcy in California in the past want to know if a small business loan is within their grasp. While the general impression is that a lender will not loan money to an individual who has filed bankruptcy in the past, obtaining a small business loan is possible under certain situations and with some considerations. Small business owners and their businesses are intrinsically connected. Running a small business means that you will personally guarantee loans. As a non-legal entity, you are the business, and the business is you. Therefore, it doesn't matter to lenders if your previous bankruptcy was due to personal or business debt; instead, lenders focus on whether you were able to reestablish credit, have a business plan, and are earning a steady income. A bankruptcy will remain on your credit report for 7 to 10 years depending on which type of bankruptcy you filed. If you are seeking a loan during this period, you are likely to experience much more difficulty in obtaining a small business loan. This level of difficulty will start to decrease around the two-year mark. This timeframe gives you 24 months to put maximum effort into increasing your credit score by making payments on time and not taking on too much additional debt. Business plans typically help business owners approach private or public lenders for a small business loan. They lay out operations of the business, what products you will sell, and how you will sell them. While putting one together may seem like a daunting task, the “keep it simple” motto can be applied to the creative process to ease some of the anxiety surrounding developing a business plan. 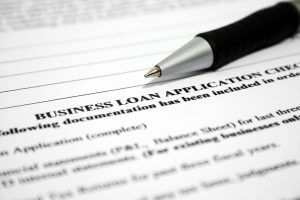 Business owners have been able to obtain lending with a business plan as short as one or two pages. The critical point is that a business plan shows lenders that you have put time into developing a program that is executable. The easier to understand and grasp the concepts, the better. While business plans are grand, showing a revenue stream from business operations is even better. If you have a pre-existing and consistent income stream, banks will be able to ascertain your ability to repay the loan. It will be impossible, in most cases, to obtain a small business loan without meeting or speaking with a loan specialist to explain any discrepancies or negative information contained on your credit report. In preparing for this conversation, you should be prepared to explain either on your credit report. Spend time to go over your credit report after bankruptcy and create a written explanation for each negative item. This preparation will better prepare you to answer any questions that may arise during the loan consideration phase. While it is natural to envision approaching a large, national bank for a small business loan, do not discount the many alternatives in small business financing that are available to you. Smaller, local credit unions can have less stringent requirements for loans and can be an excellent source of business funding. Additionally, many online business loan companies have emerged over the last five years that offer even more alternatives if you have been turned down through more conventional small business loan venues. While there is no guarantee that you will be able to obtain a small business loan after bankruptcy, if you create a business plan and wait at least two years after bankruptcy will greatly improve your odds of obtaining funding. In addition, you should try to consistently improve your credit score, demonstrate consistent income, and explore multiple options for financing. II you currently own a business but are having trouble making payments to vendors or on personal loans, bankruptcy attorneys in Sacramento California can assess your situation and advise you on whether filing a California bankruptcy can help you discharge debt while keeping the assets that you already own.